What Has Hampered Africa’s Development? Many factors have hampered Africa from reaching its full potential. As its population has doubled overall and tripled in urban areas in the past 30 years, agricultural production and food security have had to keep pace. Africa is the only continent where the absolute number of undernourished people has increased over the past 30 years. There are many reasons for the challenges, but three in particular stand out. A multitude of (somewhat uncoordinated) initiatives. There are many great initiatives, with local and foreign funding, that aim to enhance the state of agriculture in Africa. However in many cases these programs are fairly uncoordinated, often have overlapping mandates, and, to a certain extent, compete against one another for funding and private investments. Pan-African coordination and focus is critical to the future. Good ideas but not enough implementation. Forests have been harvested to produce the paper to document all of the strategies that have been developed. Through the years, countless commitments have been made and plans have been developed. Although progress has been made, now is the time for this to be all translated into concerted action. Insufficiently developed ecosystems. The ecosystems required to develop a solid agricultural market in Africa are often underdeveloped in terms of political commitment, the quality of government, infrastructure availability, and regulatory frameworks, among other factors. There is a need for a true commitment among governments and stakeholders to put the basics in place to make these ecosystems happen. -Best practice sharing. Providing a best-practice clearinghouse for farmer associations and governments. -Support of governments. Aiding governments in skills development and coordinating cross-country initiatives. -Public-private partnership initiatives. Creating a first “port of call” for large corporate and institutional investors to ensure investments’ effectiveness and coordination. Clusters (macro). With agricultural ecosystems in place in this final, macro level of transformation, Africa can become a major agricultural player globally, facilitating the export of its products outside of Africa. Cluster-specific initiatives are typically based on product availability and production competence. Better supply, from farmers who have learned about and invested in improving their yields and product quality, helps build a stronger market. Dairy exports from New Zealand are one successful example of the development of a world-class ecosystem. Years ago, the New Zealand Dairy Board created a platform for best-practice sharing among its members to improve productivity and product quality and actively created export markets for excess products. Some of the Dairy Board’s activities became part of a new cooperative called Fonterra—now one of the leading global milk processors and dairy exporters, with roughly 22 billion liters of milk produced annually. Fonterra also produces more than 2 million tons of dairy ingredients, specialty ingredients, and consumer products annually—95 percent of which are exported. This allows New Zealand to punch above its weight in the global dairy market. Cluster-specific export initiatives like Fonterra should be a government goal in Africa. From a pan-African perspective, identifying sectors and coordinating initiatives across countries are essential steps to a transformation strategy. African smallholders do not yet benefit from best-in-class global farming practices. They are often trapped in a vicious cycle that prevents them from improving their productivity and income. These farmers are, however, the fabric of African rural societies. Their future success is crucial as Africa’s population grows and urbanizes. Strategies are only as effective as the change they bring about. 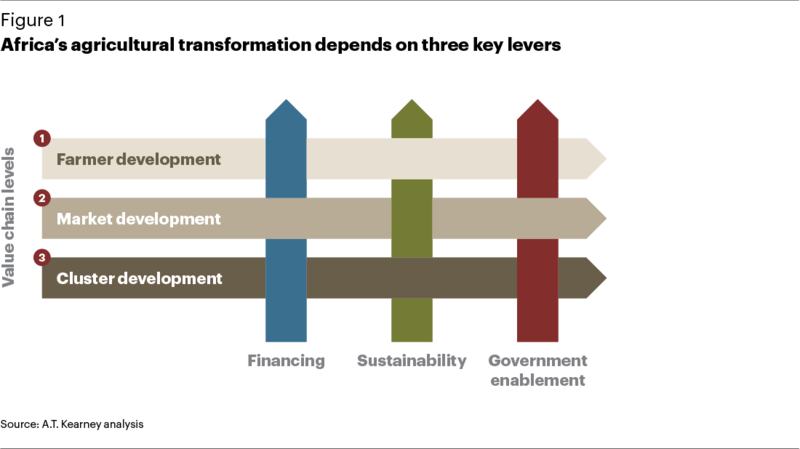 Truly transforming African agriculture at the farmer, market, and cluster levels depends on three key levers: financing, government enablement, and sustainability (see figure 1). 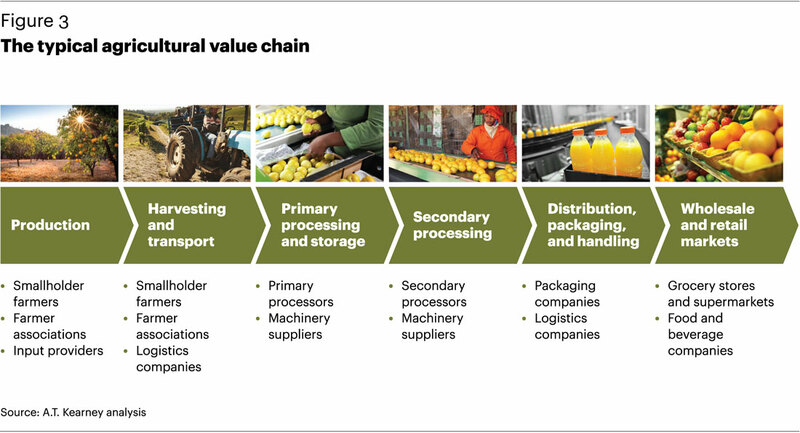 Improve access to marketsOne often-overlooked success factor is the structure of market incentives across the value chain from production to market (see figure 3). 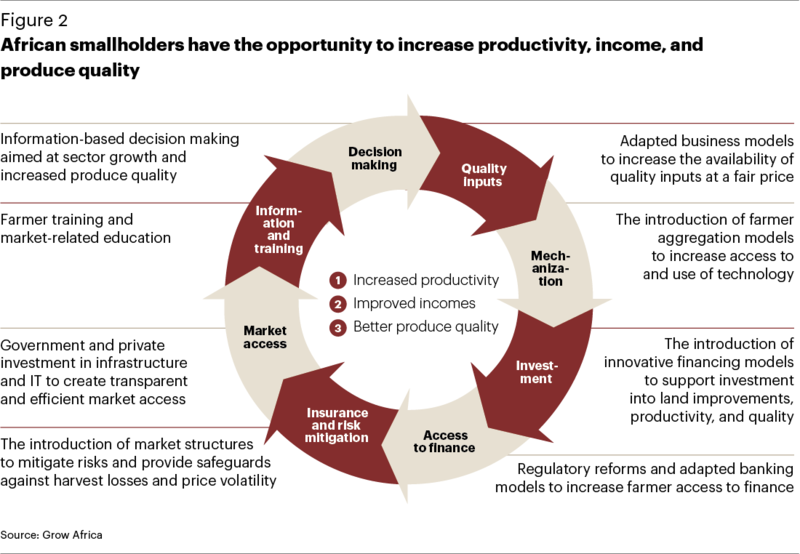 Unequal distribution of market power and insufficient access to the profit pool at various stages can have huge implications for farmers in low-income countries. Improving market access and transparency can balance market power, especially for smallholders. Apply technology to increase market transparency Ironically Africa has all the opportunity to jump the development curve and become a leader in applying technology to smallholder farming. The continent has high cell phone penetration and even in rural areas connectivity is good. Advanced cell phone applications (like banking, weather information, and market data) can help smallholders tremendously in their decision making and in improving their productivity. There are many examples of innovative uses of state-of-the-art technology that needs to be scaled across Africa (for example, small soil-testing devices that send data to a lab in Europe, which in turn provides soil-specific fertilizer advice by text message to the farmer). The interests for non-traditional private investors and African smallholder farmers go hand-in-hand. Africa provides a massive opportunity to test and commercialize data technology innovations and farmers are longing for the data that provides them with productivity and market opportunities. In specific, non-traditional agricultural sector players such as banks and telcos could step into this field and open new markets for themselves. The right enablers can have an outsized impact on agricultural outputs. This is exemplified by sustainable and equitable access to water. Promoting techniques such as on-farm water management, rainwater harvesting, and conservation can potentially triple crop yields. Improving rural water infrastructure can improve productivity, especially for women who spend hours a week collecting water for domestic and agricultural use. Water capture and storage solutions can mitigate the impact of rainfall uncertainty. Well-negotiated and managed private-sector presence in commercial agriculture can ensure fair access to water for smallholders. Empower women Many studies suggest that female empowerment can speed up development, as women reinvest their incomes in their families. For example, in Brazil, when income is a mother’s responsibility, a child’s survival probability increases by 20 percent; when the same happens in Kenya, a child is about 17 percent taller. If women worldwide had the same access as men to productive resources, yields could increase by 20 to 30 percent. The FAO estimates that gains in agricultural production alone could lift as many as 150 million people out of hunger. Most people today recognize the opportunity to close the gender equality gap; however, words of support only go so far. Recent work by the World Bank and the ONE campaign point to several barriers that women currently face in agriculture, including struggles finding adequate labor on their farms, unequal access to inputs, fair access to quality farmland, access to knowledge and training in farming methods, and a long-standing gender gap in education. Empower youth Sub-Saharan Africa’s population dynamics offer a unique opportunity, if managed well. Half of the population is younger than 25; every year between 2015 and 2035 there will be a half-million more 15-year-olds than the year before (see figure 4). 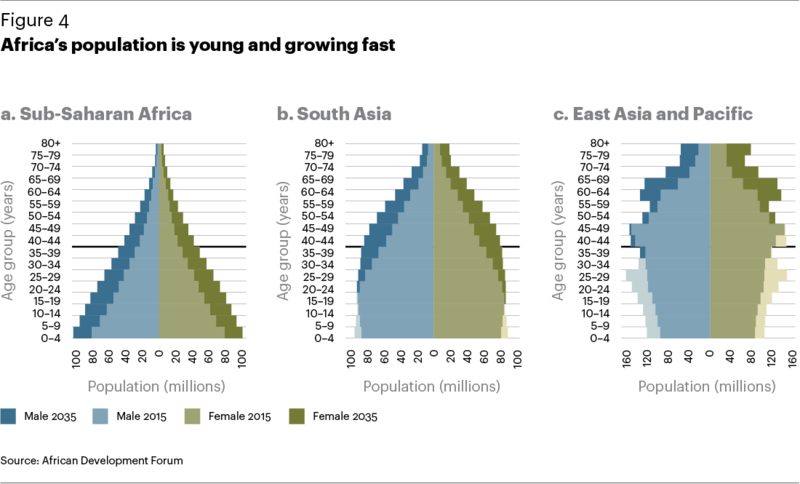 This demographic dividend could radically accelerate Africa’s transformation if properly harnessed. Conducting a cluster review can help countries identify more value-retention opportunities. The challenge is identifying what crop types will be suited to export, where those crops are currently cultivated, and the current stage of excellence by crop (see figure 5). Africa has traditionally struggled to compete as an agricultural exporter, starting with the challenges we outlined earlier in this paper. Erratic legislation impacting levies on seeds, fertilizers, and agriculture processing equipment, and duties on exporting agricultural output, can hamper exports. These key constraints vary by country and value chain. As such, it is instructive to look at select African countries and how their export value chains differ, and how the right solution can bring export success to Africa. Rice has in recent years become Africa’s largest and fastest-growing import, valued at $3.5 billion, or nearly half of total consumption, in 2009. Urban consumers are seeking more storable and easily prepared foods, and higher-income consumers are showing a distinct preference for higher-priced imported rice with aromatic qualities. Given the size of domestic markets and good rice-growing conditions in Western Africa, several governments have begun raising import duties on rice to boost local agriculture and production. The improved policy incentives, coupled with higher world prices, have brought sharply higher local production in some countries, with private partnerships taking control of elements in the value chain. To determine global competitiveness, Senegal benchmarked value chain costs against the world’s leading rice exporter, Thailand, for both white rice and aromatic rice. In Senegal, rice from the Senegal River Valley is produced under irrigation and partial mechanization delivers the crops at costs only slightly above those in Thailand. With relatively efficient milling and transportation, local rice can be quite competitive, even more so if aromatic rice varieties can be produced commercially at the correct scale and quality. Senegal has made major progress increasing yields to 3.6 tons per hectare nationally (and more in irrigated areas). Competitiveness has been held back, however, by the difficulty of accessing secured, tradable land rights. This discourages significant private investments in irrigation systems, which is key to increasing production to boost exports. Nigeria is following a similar path in limiting rice imports, developing policies to incentivize local cultivation and allowing for exports to neighboring regions. It is clear that the potential and willpower are there in West Africa for a more effective rice value chain that ultimately can be a solid base of exports. Maize is a crucial food staple in Eastern and Central Africa, with per capita consumption in some countries exceeding 100 kilograms, and feed consumption growing 6 percent annually. Most years, Zambia (133 kilograms per capita consumption) is self-sufficient, but there is substantial room for growth. With more than five million hectares of uncultivated land suited to maize production (nearly 10 times the current area), Zambia could become a breadbasket for its region. High yield and price risks and a lack of suitable financing and agri-insurance options have constrained further expansion thus far. For now, a handful of large- and medium-sized farms produces more than half of the country’s maize; at the other extreme is a huge pool of poor smallholders who do not produce maize at all and struggle to meet their daily needs. Helping these farmers meet their potential is key to bringing Zambia to its full potential. There are a few key steps to make this happen. Transport costs are high, so affordable access to a well-run port is vital for trading any surplus maize. Higher fertilizer costs and limited mechanization result in higher labor costs, so improving mechanical harvesting will have an exponential effect on efficiency. Those examples highlight the varied opportunities for Africa to becoming an agriculture-trading powerhouse. The challenge lies in how to increase the portfolio of crops that can be exported at world-class productivity levels. At first, the focus should be on clusters with established comparative advantages and strong market prospects. With resources few and challenges large at first, a strong focus on a few strong locations or value chains offers the opportunity to pilot cross-country collaboration and difficult reforms, demonstrate success, and learn from scaling efforts. It also channels scarce resources most effectively to tackle a critical mass of issues, whereas scattered reforms and public investments may find little success, given the long list of constraints affecting agribusiness. A tight focus on a particular area or value chain may also increase the chances of achieving sensitive and complicated cross-cutting reforms (such as piloting fertilizer and land reforms) and dealing with vested interests between governments and private institutions or investors. 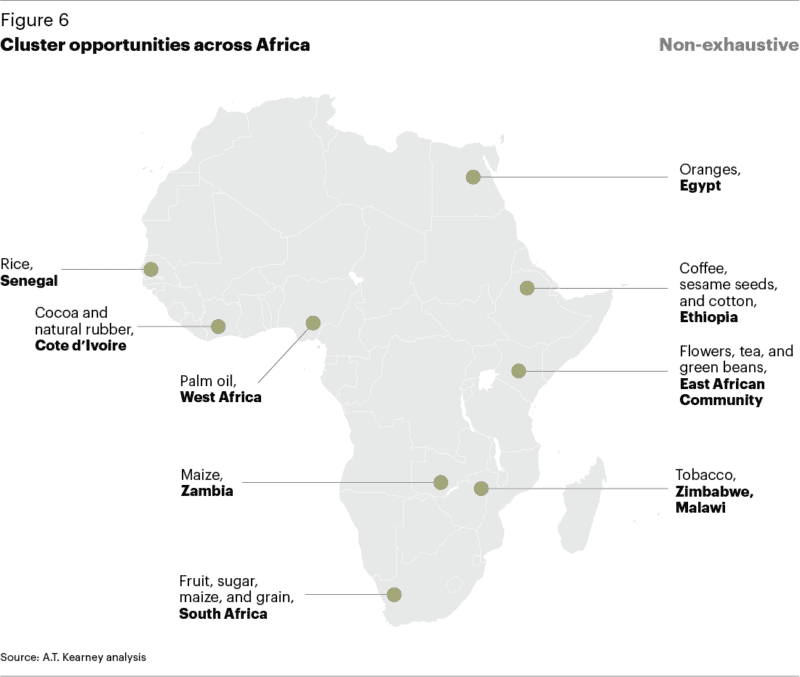 Figure 6 offers an overview of some of Africa’s cluster opportunities. The right clusters are driven by interactive, iterative, evidence-based analysis in which the main opportunities and constraints are identified through a combination of desk research, expert interviews, and workshops. In general, clusters with competitive advantage and already-proven investor demand are preferable over attempts to initiate new industries in new areas. Key policy reforms need to come before committing to large public investments. Priorities and action plans will need to be flexible enough to meet unanticipated cluster opportunities, yet also allow for constraints that will inevitably emerge. Finally, and crucially, strong governance and monitoring systems should be put in place to correct or terminate failures but most importantly replicate and scale up successes. It is time for Africa to grow! A few key numbers highlight the opportunity—and the challenge. To meet growing global food demand, production must increase by an estimated 50 percent by 2030. Sub-Saharan Africa’s 33 million smallholder farms—a number that will increase rapidly as the population continues to increase—contribute up to 80 percent of the region’s food supply. Improving the odds of prosperity for these farmers lies at the heart of prosperity for African agriculture. Success at the farmer, market, and cluster levels requires assistance from many sources. Governmentsneed to focus on significantly improving the enabling environment for local agriculture, particularly as it comes to land rights, infrastructure, market access, and elevating women’s roles in society. Pan-African institutions such as the African Union can help develop cluster opportunities across the continent and promote intra-Africa trade and best practice sharing. The private sector can help invest with funds and knowhow, understanding that Africa’s potential for growth and its untapped arable land offer huge opportunities in spite of the risks. Public-private partnerships can unlock value, as long as both sides share the onus of success. No longer must Africa go hat-in-hand to feed its vibrant and resourceful population. It can help its own people feed themselves, their villages, towns, and countries. As scale and quality develop, export markets from the continent can flourish, leading increasingly to not just poverty alleviation but wealth creation. As more inhabitants see the promise of a better future in agriculture, many more clusters will be developed, truly making Africa the breadbasket that the world so desperately hungers for. It can be done. Now is the time to put our shoulders to the wheel.